Adorable Vintage mini souvenir set from Flagstaff Arizona. Set consists of a plate 3 1/2" a saucer 2 1/2",and a little cup 1" tall. 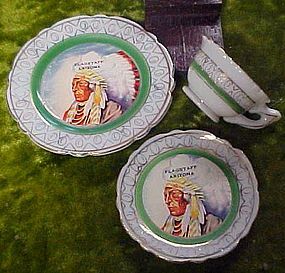 Plates have a transfer of an Indian Chief and the little cup has the matching band of color as the plates do. Gold filigree decoration and trim. Original wood display stand comes with them. Made in Japan. All pieces are perfect with no damages. I will be listing more in different colors. I have 2 green sets.